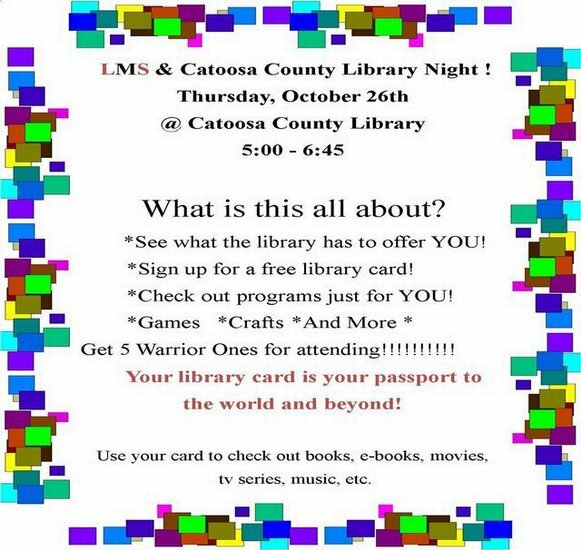 Mark your calendar for Thursday, Oct. 26th from 5-:645 to attend our event at the Catoosa County Public Library. All three Catoosa County middle schools will be in attendance. Students can sign up for a library card and explore all the great things the public library has to offer. All LMS student in attendance will receive 5 PBIS Warrior Ones from Mrs. Jenkins. Come out and enjoy the fun!